Major New Features; Type System Changes; New and Changed Operations; New and Changed Statements; Modeling Enhancements; Standard Packages; Improved I/O; Minor Semantic Changes; Lexical and Syntax Changes; What's Next. 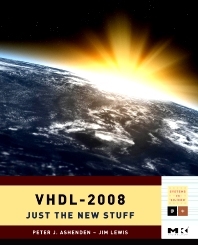 VHDL-2008: Just the New Stuff, as its title says, introduces the new features added to the latest revision of the IEEE standard for the VHDL hardware description language. Written by the Chair and Technical Editor of the IEEE working group, the book is an authoritative guide to how the new features work and how to use them to improve design productivity. It will be invaluable for early adopters of the new language version, for tool implementers, and for those just curious about where VHDL is headed. Helps readers to learn the new features soon, rather than waiting for new editions of complete VHDL reference books. Tutorial style, making it more accessible than the VHDL Standard Language Reference Manual. Chairman, IEEE Working Group on VHDL, SynthWorks Design, Inc., Tigard, OR, U.S.A.